Printed sigil and "TARGARYEN - GAME OF THRONES"
Looks great over vinyl siding too, if you don't live in a brick castle! There's a storm coming to Westeros. A storm of fire and blood. Your humble abode might not reside in the seven realms, but that's not reason not to prep your home for the arrival of Queen Daenarys Targaryen. And whether you're building your fan cave in prepartion of nights of watching Game of Thrones, or are planning on having a Westeros themed party, you're going to want to make sure you have everything just right in anticpation of the Khalessi showing up. Therefore, there is one essential piece of fan gear that you must have in your home. 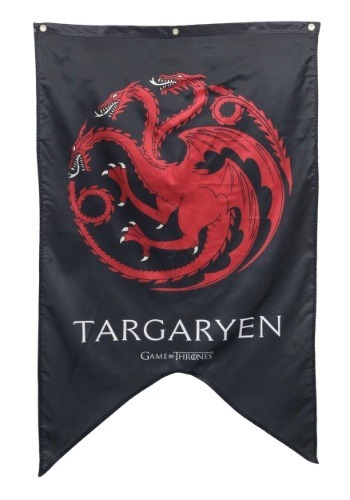 This Game of Thrones Targaryen banner! It's HBO officially licensed, and it features the ancient sigil of House Targaryen against a black background, along with "Targaryen" and "Game of Thrones" printed wordmark logos. It measures 30 inches by 50 inches, it has 3 metal grommets that allow you to hang it as desired, and if we may say so, it looks equally as cool indoors and it does on the exterior of your castle walls. Complete your fan theme with this signature banner, and you'll be ready to welcome the Mother of Dragons!